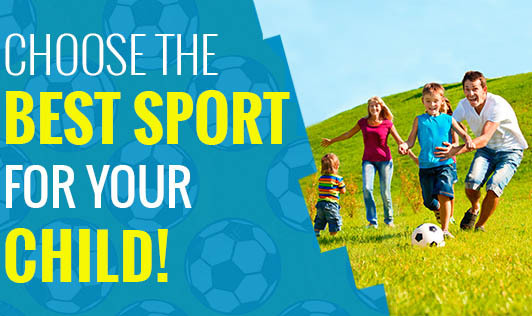 Choose the Best Sport for your Child! Sports are a type of physical activity. Each sport has its own significance. Gaining benefits from each sport depends on the way the sport is played. Children develop interests for sports at a young age. Each child is different, and you need to first observe if your child is a team or an individual player. • Try different sports: Experiment with your child's ideas. Some children generally are more energetic than their counterparts. You can take the child out for football, basket ball, tennis, badminton, cricket etc. For those with less energy, swimming and table tennis can be a good start. However, it is important to expose children to different kinds of sports to know their energy levels. • Recognize passion: If your child is keen on a certain sport, he would be enthusiastic to attend and practice the same. In some cases, your child may not show any interest. Encourage the child and expose them to more games. • Spend quality time: Sometimes, spending time with your children can help you understand a lot of details about your child. A conversation with your child can help you identify your child's interest in indoor or outdoor games! • Get a checkup done: It is always better to stay fit. Meet a doctor to get any tests done. Discuss the "sports plan" with your doctor and talk about the physical demands of the sport. Many times, children are injured in sports because they are not quite ready physically or they have a limitation that they didn't know about before. • Know your child: Consider some less popular sports. You and your child might want to think about martial arts, cycling, volleyball, running, dance etc. All of these count as sports and will help your child learn important skills and staying fit. • Know your child's body type: If your child is sedentary, start with small things. Getting a skateboard or a bicycle can be a good way to transition a sedentary child away from books or video games and into a more active lifestyle. Outdoor sport is a type of physical activity and helps your child stay fit and healthy. Many children may like indoor sports like chess, snake and ladder, lido etc. For such children engage in yoga or simple exercises at home. Always remember each child is different in his own way. Encourage them to be a sport!